I can empathize with my pal Joey up there, though I feel like my talents lie more in the qualitative realm, food-wise, than the quantitative. I will probably never paint anything that lands in a gallery anywhere, or sing on a stage other than at karaoke night, but dammit, I can make a good meal out of nearly anything! The other night, having failed to plan ahead, I pulled together something that resembled sushi or lettuce wraps, but was much better (I hate sushi and don’t like how lettuce wraps fall apart or break). We had a head of savoyed cabbage from a local farm, the normal pantry and freezer items, and sriracha I had just made from scratch. I sauteed some grass-fed ground beef with plenty of sliced peppers, onion, garlic, and ginger, added in a bit of soy sauce, korean chili powder and honey. 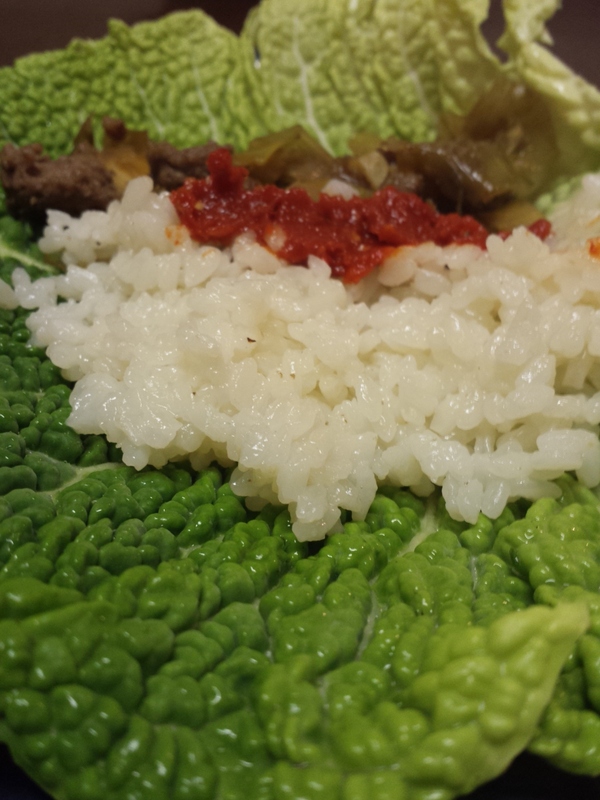 I dolloped clean cabbage leaves with that mixture, sticky calrose rice, green onions, and homemade sriracha. 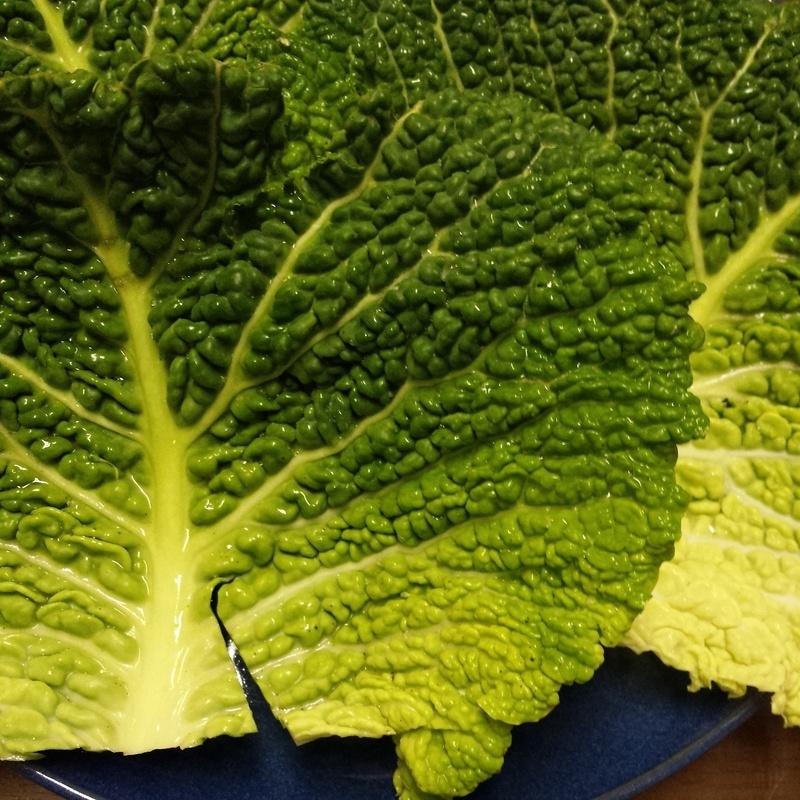 There you have it – cabbage wraps, or rolls, if you want to get fancy. The heat of the filling cooks the cabbage leaves just right, leaving a nice element of crunch without making them difficult to keep together. Really, it was more assembling than creating, but I did enjoy the fusion-like blend of a Japanese concept with Korean-style ingredients. This would have been great as an economical vegetarian dish with winter squash instead of the beef, had I thought of it, but it’s fine. The lean, grass-fed beef provided all kinds of Omega-3 fatty acid goodness, to help us prevent heart disease, inflammation, and autoimmune difficulties, as well as tasting incredible. Ohh! Carrots. Carrots would have been great here, as well. Brown the beef and onions. Add the garlic and ginger and cook for about a minute, until you can smell them both and want to dive in. Add the soy sauce, then the honey and chili powder (if using), then turn the heat off. Add to each cabbage leaf some of the meat and vegetable mixture, then smoosh some rice in, as well. Top with hot sauce, roll ’em up, and eat. This makes a hearty meal with leftovers, for two. 15 Mar	This entry was published on March 15, 2015 at 4:44 pm and is filed under Collection. Bookmark the permalink. Follow any comments here with the RSS feed for this post. Yum! Even I can do this!